Haircut 100 was truly one of the New Wave era's coulda-shoulda been stories. Just when they exploded onto the scene with their first album, Pelican West, their main songwriter/singer quit for a solo career and they were never the same trying to replace him. During this period, many bands were taking rock, soul and dance music, and combining them into new and exciting songs. As a rebellious response to the repetitive disco era that proceeded it, many new artists were suddenly landing on college and "new rock" radio stations as imports, and being snapped by major US labels. 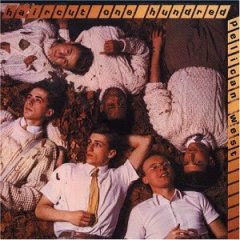 Such was the case with Haircut 100, which was mainly the vehicle for singer/songwriter Nick Heyward. They landed out of nowhere on WLIR-FM in the early 80's with their first import single, "Love Plus One" and you'd never really heard anything like this. Whereas a number of English New Wave acts were borrowing from soul and Motown (Spandau Ballet, Paul Young, Naked Eyes, Kim Wilde, The Jam, etc. ), Haircut 100 took a decidedly South American route. As you'll see from the video below, they dressed like good little English school boys, like a smiling bunch of goody two-shoes. Every video I've seen of them, they've been in an unusually chipper form, wearing the kind of clean cut semi-preppy outfits any mother would love to see on their daughter's dates. After the opening scratchy guitar chords, a catchy marimba riff marks time with the kick and hi hat, the electric bass slides down, and it's this upbeat pop tune with a slightly Latin feel, a soprano sax wailing away, and some congas under the mix. Heyward's got the typical vocals of the era -- almost disaffected, nothing amazing, but totally capable of carrying the clipped melody. And if you're going to spend the time studying the lyrics, well, they're almost nonsensical. They are fun to sing, as truly silly as they are. But this is what a great pop single was at the time -- just different... clocking in under four minutes, danceable, happy as hell, and unfailing melody. Thank God, Arista signed these guys up and released Pelican West in the US. However, they probably lived to regret it when Heyward suddenly bolted the group to go it alone at the height of the first album's fame. While Heyward made a bit of a dent in the UK by himself, he pretty much went nowhere here. What could have been. One guy who really did make it in the band besides Heyward (if you call his career as such) was American-born drummer Blair Cunningham, who actually joined Chrissie Hynde and her Pretenders later on after original drummer Martin Chambers, played with Paul McCartney and others. Below is the official "Love Plus One" video, shot on some kind of kitschy jungle set with torchlights and swinging vines on a sound stage somewhere. Heyward seems just a bit goofy, nodding his head to the right in case you don't understand the first line of the song (I didn't, for years).